To understand the answer to the question, you will have to understand what is sushi and how it is prepared. Those questions will be answered later in the article. If you have chosen to open this article, it is because you plan to keep your sushi as long as possible. Even if it can last, remember that sushi is made from fish, and fish is better when it is eaten fresh. So, even if you want to save your sushi for the next day or a few days down the road, you have to remember that sushi, like fish, will be best if it is eaten fresh. Also, after several days of storing the item, you should not expect the sushi to taste the same. Some of the flavors may have changed, so it is possible that you will be disappointed. In this article, we will discuss the shelf life of sushi and teach you how to store it properly. Sushi can be described as a Japanese delicacy that has been made popular in recent years, thanks to globalization, of course. People have been so caught up in the sushi craze that they barely take time to do the research to understand what it is or how it is prepared. Some people who have an understanding of what sushi is, choose to stay away from it because they fear that it will get them ill. Sushi is raw fish. In Japan, sashimi is used as the main ingredient to prepare the dish. Apart from fish, sushi also contains seasoned vinegar rice. Some establishments just sell rice and seaweed. That is not authentic sushi! There are different types of sushi for you to have and choose from. First, there is the nigiri-zushi. This is popular and is made from rice and fish. The seafood used in this sushi is usually tuna, yellowtail or shrimp. Seaweed sushi is known by the name maki-zushi and is classified as tuna or cucumber rolls which may be called norimaki. Other types of sushi include the inarizushi which is deep-fried and the chirashi-zushi with rice and other ingredients on top of it. Some people like to prepare sushi using a sushi making kit. Whether you use a sushi making kit or prepare sushi by hand, it is the same concept that is applied. If you have to prepare it yourself, it is easy to do so. How it is prepared may determine how long does sushi last. Once the fish is prepared well, food-borne illnesses can be prevented. If sushi is to be prepared, usually frozen fish is the fish of choice because the coldness would have killed some of the bacteria that would feed on the dead fish. The best sushi is the one that is prepared using fresh fish. If you wait to use the fish, it becomes more susceptible to bacteria. The fish is thawed and sliced usually using a sushi knife, tendons are removed, and the skin is scraped off the fish. The fish is then cut for the type of sushi that has to be made. If you are making sushi rolls, you have to use rice or seaweed. If you are using rice, it needs to be boiled and then stirred with vinegar and sugar for taste. You are then required to spread the rice on a rolling mat. Some people usually may add other seasonings to the roll to create some flavor. How Long Does Sushi Last? You should not keep sushi for more than a day’s time. The sushi is made from raw fish and the longer the fish is not consumed, the more it becomes susceptible to bacteria. For that reason alone, you should not want to eat sushi. If the sushi is prepared with cooked fish, it will have the name California roll. So, if you intended to keep sushi for more than a 24-hour period, you should get or make this one instead. 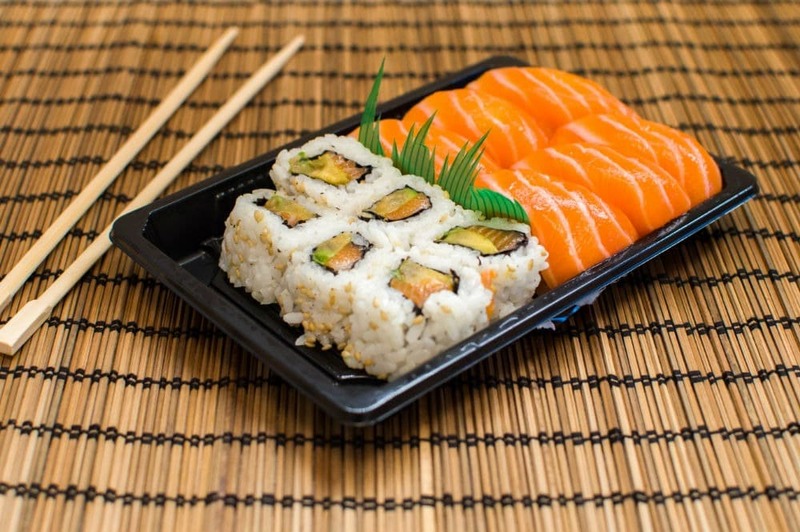 Some restaurants do not allow customers to leave with their left-over sushi because they know the risk of consuming raw fish after an extended period of time. Even if it is cooked, you should not eat the sushi more than three days after it was prepared because the quality deteriorates as the moisture is lost. Also, the taste is not going to be as good as when you first had it. You will know that the sushi needs to be tossed out just based on its smell. If it smells like fish, then you should not eat it. To be safe, just don’t eat sushi if days have passed. It is advised that you store sushi within half hour of preparation if you plan to eat it the next day. How Do You Store Leftover Sushi? You can store leftover sushi (if you insist) by placing in it a plastic wrap before sealing it in an airtight container and putting it in your refrigerator. This is why you may see packages of sushi being sold in the grocery. These packages of sushi may be stored in chillers. Most of the time, the sushi packages that you see being sold are the cooked variety. You should always pay attention to the expiry date and the smell before buying this sushi especially if you do not know how and under what conditions they were prepared. How long you store sushi will depend on how it was prepared. If the sushi is raw fish, then you should not store it for more than a 24-hour period. If the fish is cooked, you should not store it for more than three days. If you store it for a longer period of time, it becomes less safe to eat and loses moisture. That is why it is advised that you eat sushi as soon as possible. That’s a great help… I’ll toss it,😟!